I couldn't resist the temptation. There was just too much hype and buzz. I practically threw my Hamilton at the Pinkberry lady. And what did I get in return? A refreshing, tasty shaved ice treat that would have been way more refreshing and tasty without the Pinkberry signature plain yogurt mucking up the treat...blech. WTF? I realize it's 25 calories per oz. That's a very big plus. But it's not good. And it's not cheap either. For those that have not ventured into the Asian dessert world, shaved ice is a freakin' fantastic concoction of condensed milk, some sort of sweet syrup, your choice of fruits and flavored gelatin and/or red beans, plus mochi all topped with a bed of shaved ice. And you can get quite a nice serving of this for a mere $2.50 at the Old Country Time Cafe in Alhambra. Pinkberry puts a twist to the shaved ice by adding that disgusting yogurt to it. You also have the option to just get the yogurt with toppings. My posse and I tried both and the pics are below. Please see Abul, the camel plush, for size perspective. 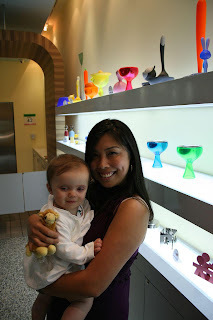 Also included is a pic with me and one of my posse members hanging out in the ultra-sleek store. If nothing else, it makes you feel really cool to be Pinkberrying it up. I really extended my bday this year and had like 5 different bday meals, some of which took me out of the 'Dena burbs. I know, it's crazy talk. It's this weird phenomenom that I believe also occurs in the "South Bay Bubble". It's like there's an invisible electromagnetic border that surrounds the Pasadena borders which keeps all residents within town at all times, excluding going to and from work. 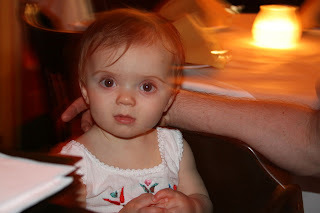 Anyway, W & C (aka Fro Yo) and sweet little peapod took A & me out for dinner at Electric Lotus. W & C discovered a long time ago what we recently and tardily realized - Indian food is freakin' delish! So now we bond over said freakin' delish cuisine. We even drive out of zip code for good Indian grub...to bohemian turned hip towns like Los Feliz. A couple of observations on our outing. One, I forgot what it feels like to walk the streets among the homeless. The most exposure I get is the clean innocuous homeless folks on Colorado that politely hold out a cup for change. Here it felt authentic and real. Yes Meddlesome, another reference for your delight from our Venice days. Fro Yo's antennae were definitely up during our walk. Two, it wasn't as dramatic or intense as Children of Men, but it seriously felt like the local residents hadn't seen a baby in a decade. Everywhere we went, it was like "Oohs" and "Aaahs" abounded at the sight of sweet little peapod. It was crazy! But I suppose when you are truly as sweet as the peapod, how could you not elicit such responses? Attached is a pic for your viewing pleasure. My bday had the unfortunate circumstance of landing on a Monday this year so no big beach bash or K-town karaoke night this time. I decided just a low-key dinner at a semi-trendy restaurant with some family and Kid Dynomite would be the way to go. Figured it be best to keep it small - after all, I think Monday bday celebrations could possibly be worse than Sunday night wedding receptions...I threw that in there for you Meddlesome. I know how much you despise Sunday weddings! So seeing that ketchup truly is my favorite condiment on this earth and Ketchup, the restaurant, is part of the Ashton Kutcher Dolce group, I chose this uber cool looking dining establishment. The interior is all white 60s modern furniture with lots of red accents including all red lighting. The music was a fun 70s-80s mix and the location overlooked Sunset Plaza. The menu was also very fun with entertaining signature cocktail names that included ingredients like Tang, Kool-aid and Yoohoo. But that's basically the best that Ketchup's got to offer. The food was fine but not spectacular. The service was no bueno! Our server forgot to input our entree orders so two hours into our "celebration", we're still muching on our apps. Let me tell you, fries don't taste good after two hours! The server's excuse was the best - supposedly our order went to the wrong printer. WTF So to make up for it, he told us dessert was on the house but then proceeded to bring out more desserts than we asked for so he could charge us for 3 of them. So WEIRD. Note to Ashton Kutcher: If you're reading this, please know that I am a big fan of yours and am very disappointed with my experience. Here are some pics. I haven't figured out how to position the pics so I can put comments next to them so hope you enjoy them sans commentary.